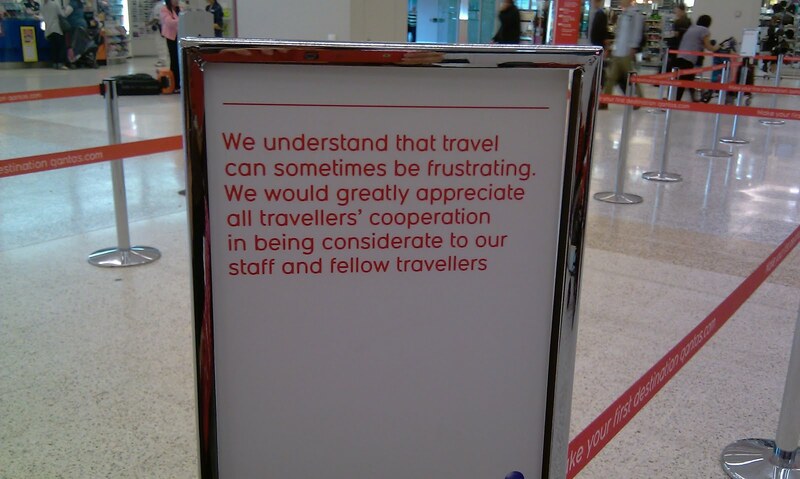 Is it possible for organisations to diffuse customer frustration using signs? The ultimate message of the signs is: Please, don’t get frustrated with us; this is the way our system works, and we’re not going to change it for you. I’ve come across two examples of these signs recently, and I felt that one was much more successful than the other. In fact, the second only increased my frustration. Here’s the one that I liked. I know that my poorly-taken pic isn’t easy to read. It’s a sign in a cafe and, while the expression might be a bit awkward, the message is simple enough. 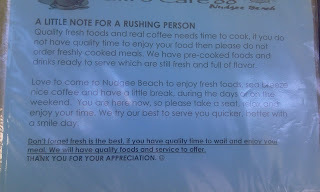 They’re saying that cooking fresh food takes time and, if you don’t have some time to wait and enjoy the beach-side atmosphere, then please don’t bother ordering at this cafe. A similar message inside encourages customers to come back another day or to order pre-prepared food if they don’t have time to wait today. I quite liked this little sign – it made me appreciate the work of the staff and encouraged me to slow down a bit. 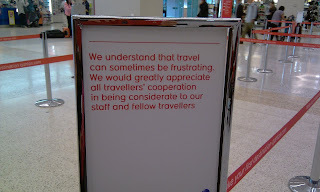 Here’s the other sign, which I encountered while waiting in a queue at Melbourne airport. I found the tone of this message quite aggressive, and it made me even more irritated by the queue I was in. Of course, both signs need to be taken in context. One belongs in a lazy cafe beside a little beach. The other is in a busy airport. And the airport sign is experienced in the context of waiting for the staff at the Service Desk … in my case because the self-check for baggage wouldn’t work for me. But in the context of the airport, I can’t help but wonder whether signs like this might work to increase people’s frustration levels (as this one did for me) and encourage a usually quiet passenger to complain (as I did). Some people will always complain when things go wrong, and the sign won’t make any difference to them. But most people can put up with irritations – to a point. But when that point is reached, they’re likely to express their frustration to the closest staff member. And it’s just possible that the tone of the sign will be the push that’s needed. For me it was. My partner and I were travelling with 2 children, 3 cases, 2 children’s car seats, and assorted hand luggage. We managed the self-check system for our boarding passes and baggage tags just fine. But keeping everyone in close proximity while we attached the baggage tags wasn’t easy. And navigating the self-check system for baggage wasn’t very successful … children getting their hands in the way of the scanner, the machine not liking the shape of our bags, the scales not able to pick up the weight of the car seats … you get the picture. So, of course, we set off for the Service Desk to deposit our car seats, only to encounter a longer, slower queue than we would have experienced in the old days … back when staff checked-in people’s bags rather than helping people to do it themselves.